You can support PawPADs donation through PayPal Giving Fund WITH NO FEES! 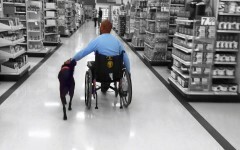 The average cost of raising and training a service dog is between $20,000 and $25,000. Because of generous supporters like you, we're able to partner our service dogs with those who need them at minimal cost or for free. Your financial support provides the resources for us to team with our prison and school partners, veterans, and those with developmental and physical challenges. "My husband is a wounded warrior...he lost more than his leg in Afghanistan and struggled with a lot before we got in touch with PawPADs a couple years ago. We were eventually partnered with Barkley just over six months later. Barkley is a dog who was rescued from a shelter and trained in a prison by PawPADs...PawPADs has given us something we hadn't had in a few years and that's encouragement. Barkley can turn on the lights and pick things up but the best thing he does is watch out for and take care of my husband. The support we have received from PawPADs is beyond anything we have ever known. This is a nonprofit that is not only changing lives but changing the world while helping wounded warriors like my husband...."